It’s a common fact that English is one of many core subjects taught to students across the country—and for good reason. Without proper competency with the English language and all of its nuances, no one could properly communicate within today’s world. Our society thrives on the ability to express ourselves properly whenever we need. As a result, we depend on English educators to teach us how to convey what we want to say. All incoming Georgia teachers are required to take and earn a passing score on the GACE (Georgia Assessments for the Certification of Educators) exam. This final exam is meant to serve as a benchmark, evaluating your skills and comprehension within your field and whether you’re ready to start teaching professionally. No teacher in the state can start their career without first passing this exam. In your case, you will have to take the GACE English exam. The GACE English test is divided up into two sections: Tests I and II. Each of these tests cover their own unique subjects (“subareas”) and are made up of two essay answer (“constructed-response”) questions and 65 multiple choice (“selected-response”) questions per test. You will be given two hours to complete either section, and can take them either on the same day or separately. Test I centers its constructed-response questions on Analysis (25 percent). The rest of its questions are devoted to Writing (37.5 percent) and Reading for Literature (37.5 percent). Test II’s constructed-response questions deals with Analysis (25 percent). Its remaining selected-response questions focus on Language (22.5 percent), Speaking and Listening (15 percent), and Reading for Information (37.5 percent). If you’re on this page, you’re likely in search of comprehensive study tools to help you as you prepare for this important exam. You’ve come to the right place! 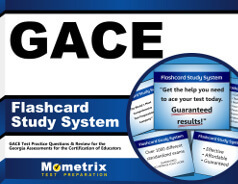 The Mometrix Test Preparation team has put together a GACE English practice test. We have conducted thorough research in building this study tool, all to ensure it is as accurate to the actual exam as possible. Feel free to use it to familiarize yourself with the exam, as well as figure out how to shape your study plan according to your weaknesses and strengths with the material. 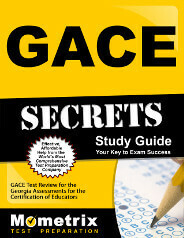 While this practice test is effective on its own, it pairs best with our companion GACE English study guide. We hope you will choose to incorporate it into your study plan. Good luck!